A man dressed in full camo strolled up next to his SUV that had a bike rack hitched on the back. He had a stringer of dead squirrels hanging from his right hip. His hair looked a little matted from sweating under his cap. The northern terminus of the Nebo Ridge trailhead was to my right. The morning was somewhat cool, with the sun shining bright, and the air warming. I checked my tires, and then squeezed some lube onto the chain as the back tire spun. Not too far north from where I was standing, it was likely that numerous people were going through the same motions as me. In the Nebo parking lot, though, I was alone. 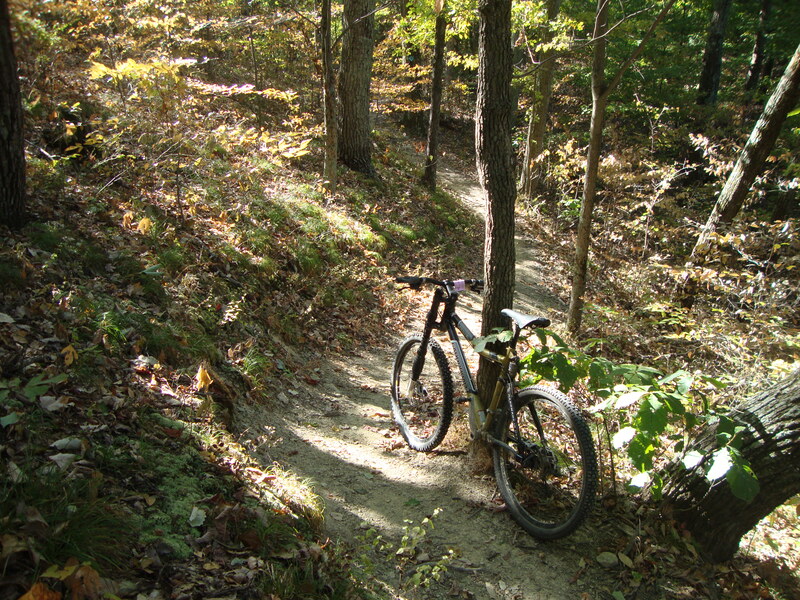 Hoosier National Forest doesn’t get the same mtb traffic as Brown County State Park. We’ve not had much rain in these parts of late, making for some dry, dusty trail conditions. Nebo was fast! A cross-country trail that is also used by hikers and horseback riders, I saw no one during my early morning ride. Dropping out, I made way to the northern side of Hickory Ridge and rode 20-18-19, a nice loop not verging on strenuous. Along the way I chatted with some horseback riders. We shared an appreciation of being outside in such beautiful weather. They were getting their rocks off, as was I.
I circled my way back around and rode the hard road back towards Houston to meet up with my wife who was on her way to pick me up. Two incidences of being chased by dogs later, I met up with her and her new-found friends: Dana and Michael, dwellers of the Harley Davidson house on main street. I’ve been around the proverbial block of “world’s friendliest people” a few times, American and Latino and African. Dana and Michael are up there at the top. They welcomed me into their home to change out of my riding clothes. They showed us around their quite humble abode. They gave us drink and offered us food. No pretense, whatsoever, was in the air. True and honest sharing, floated on the afternoon breeze. Hoosier Hospitality, is what it’s called in these parts. I now can say I’ve experienced it. By the way…Brown County may get the press, but if the conditions are right, I’d take a few hours in HNF over those groomed glory trails anyday!